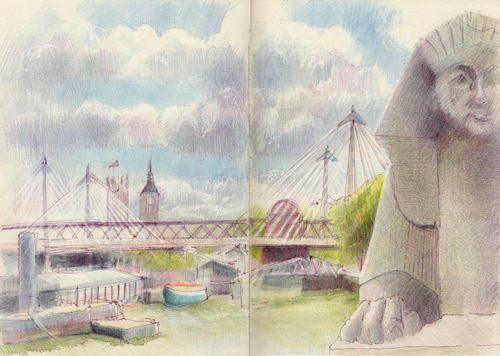 This is a summary of all the sketches on this blog which relate to London. I'll update it at the end of every month if I've posted sketches relating to London in that month. A link to this summary is included in the 'trip summary section' in the right hand column. 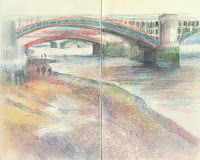 Recent sketches in London can see seen either in the list of posts relating to the current month in the archive or by clicking on the category 'London'. [Amended August 2007] The sketches are grouped first according to the area of London and as stated in the description beneath each area (rather than the date they were first posted as I'm still transferring sketches to this blog from my main blog). St Pancras International - home of the Eurostar and Lunch at Carluccios at St Pancras International - an interior view of both the restaurant and the home of the Eurostar. Plus John Betjeman and St Pancras - a sketch of Betjeman's status at St Pancras. Lunch in the National Cafe #2 - another in my series of sketches drawn while havling lunch.